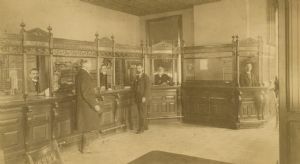 The interior of the Hagerstown Bank. The bank staff are behind windows labeled Receiving, Banking (? ), Discounts and Cashier.